An exchange of peace is a common practice in many religious ceremonies and when photographing them, it often provides a photographer with an overabundance of opportunity. It can also be quite the challenge when you must work in between many guests to capture the emotion and feeling that follow. We often photograph outdoor weddings in the summer and it allows us more mobility while still remaining relatively quiet and unobtrusive and in this case, it certainly allowed us a little bit of wiggle room to slide in between a few people and document moments like this. 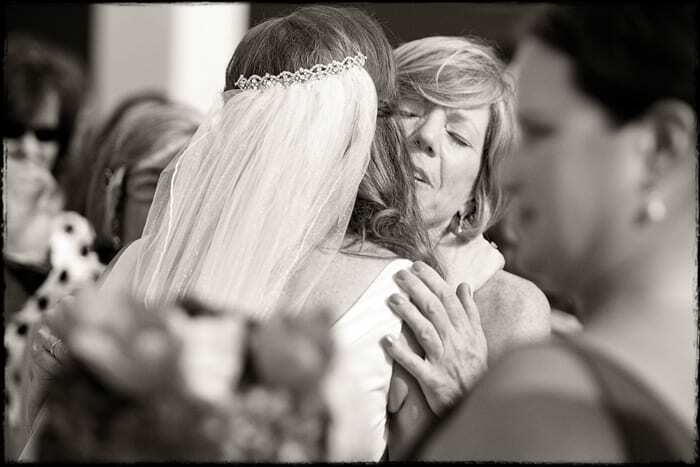 In this case, Nancy and her mother embrace for a quick moment during the exchange of peace in this ceremony at The Cavalier Golf and Yacht Club in Virginia Beach, Virginia.